WASHINGTON, D.C., December 5, 2003 – This week, as the world recognizes the threat posed by the spread of HIV/AIDS, and mourns the loss of millions, the Peace Corps continues to increase its efforts to fight the growth of this pandemic around the globe. “Although the dimensions and the human needs continue to be staggering, the Peace Corps is strengthening its commitment to fighting the spread of this terrible disease. We are working to train 1,000 new volunteers in HIV/AIDS awareness, begin new programs with an emphasis on educational outreach, and expand projects in endemic areas,” Director Gaddi H. Vasquez stated. Today, more than 2,300 Peace Corps volunteers are working in more than 55 posts around the world on HIV/AIDS projects and programs. Because they work on a grass-roots level, Peace Corps volunteers are making important progress in the fight against HIV/AIDS. In the last year, it is estimated that Peace Corps volunteers have touched the lives of nearly 400,000 individuals, including roughly 30,000 orphans and vulnerable children. 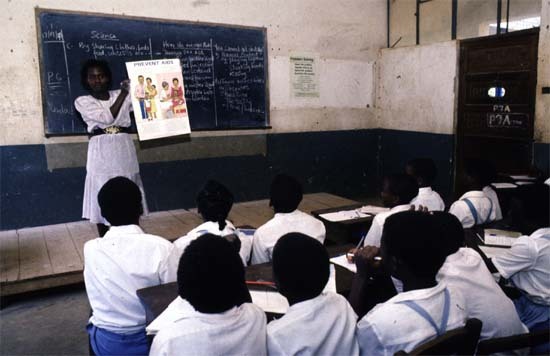 In May 2003, the Peace Corps committed 1,000 new volunteers to work on HIV/AIDS related activities as part of President Bush`s Global AIDS Relief Package. Currently, the Peace Corps is training all volunteers who serve in Africa, the Caribbean, Eastern Europe, and Central Asia as advocates and educators on HIV/AIDS prevention and care. Most recently, the Peace Corps returned to Botswana and Swaziland with the sole focus being on HIV/AIDS education and awareness programs. Volunteers employ a variety of activities in their education and awareness projects, such as training youth as peer educators, working with faith based organizations on prevention messages, coordinating with boys and girls camps, organizing awareness raising events (bike-a-thons, etc. ), teaching behavior change communication, and training youth leaders. Over the last year, volunteers have collaborated with more than 1,100 organizations worldwide, such as non-governmental organizations (NGOs), the U.S. Agency for International Development (USAID), and other groups to provide support to children orphaned by HIV/AIDS, as well as develop programs that provide emotional and financial support to families and communities affected by the disease. Peace Corps volunteers are uniquely suited to work in the fields of HIV/AIDS prevention and education, because they live and work in the communities where they serve. Volunteers are trained in the local language and are able to share information in a culturally sensitive way. In the U.S. this week, the Peace Corps hosted events at its headquarters building in Washington, D.C., designed to raise awareness about the global impact of HIV/AIDS and the Peace Corps’ role.